Two episodes recorded sometime in the last couple of days, and I sat down to watch them this afternoon when I got home from work. Basically here’s the show in a nutshell. Alexis Stewart and her friend (and radio co-host on Sirius) sit in a living room-style set and watch old footage from Martha Stewart shows, and they totally rip on them. They make fun of the clips on all levels, and even venture into the gutter. I was laughing so hard during the first one I watched that both boys migrated to the couch…AND STAYED THERE THROUGH THE SECOND SHOW*. 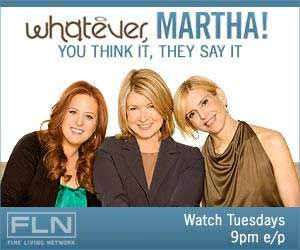 What I love about it, besides how funny it is, is that I’m a fan of Martha Stewart and it is still freakin’ funny. I love that she executive produces this show; she can totally laugh at herself. Is anyone else watching it? Try it out, especially if you need a good laugh! *In talking about it over dinner, JIM even said he’d like to see it. But that’s because he can’t stand isn’t a fan of Martha and likes the idea of someone making fun of her. I haven’t tried this yet. Maybe now I’ll give it a try. Thanks for the clips to help make up my mind. Maybe it’s just b/c I’m tired. Now, it could just be that I’ve walked a mini marathon and I’m in a rather foul mood, but her daughter seems like an arrogant little cow, and if my child ever made an entire show mocking me, I think I’d disown them. I hope that didn’t sound snotty; I meant it to sound friendly and cute. Basically Martha’s daughter is getting paid to do what we all do to our mothers, and that is make fun of everything they do. I’ve seen the commercials but don’t have this channel, so sadcakes for me, b/c it looks pretty funny. Especially since that’s what I do everytime I watch Martha Stewart. I’m both amazed and horrified by her. Meh… we never get to watch all the good stuff over here. Glad you’re enjoying the show though. With all that crap on tv its good to have something great to watch. Julesie: I *never* make fun of our mother. (hee hee…couldn’t do that with a straight face, errr, keyboard…) But you’re welcome to watch it over here anytime. I’m going to have to check it out. Martha is coming here next weekend, I may get to meet her! I have never heard of this show, but those clips are hysterical! Sandpaper and a drill to make s’mores?! And, the comments about her outfits in that second one? Too funny! And, exactly what every other person watching was thinking! You’re definitely not the last; I hadn’t heard of it till you brought it to my attention via this post! Oh, I hadn’t heard of this show, but you know I am going to be watching this Tuesday night! Thanks! Next post: If Only A Frosting-Covered Jeremy Piven Had Been Available, It Would Have Been A Perfect Evening. Previous post: Busy Brain: Enter With Caution!